Rogue Legacy, the critically acclaimed genealogical rogue-"LITE", has arrived. Editor: Cellar Door Games Inc. 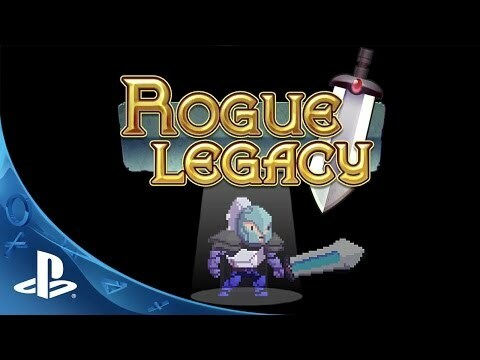 Rogue Legacy, the critically acclaimed genealogical rogue-“LITE”, has arrived. Every time you die, your children succeed you. Each child is unique; one could be colorblind, while another could be dyslexic. But that’s okay, because nobody’s perfect. So if you’ve ever wanted to play as a bald ninja dwarf now’s your chance! A procedurally generated castle means every run is different. Tons of unique traits making every play through special. Want to be dyslexic? Now you can! 10 different classes to master! Each class comes with unique abilities that change the way you play the game. All wizards have beards. Regardless of gender. Equip your heroes with powerful weaponry and armor, and imbue them with special abilities like flight, dash, and air jumping. Massive, expandable skill tree. Rack in the loot and upgrade your manor, giving your successors a wicked sweet edge. Copyright(C) 2011-2014, Cellar Door Games Inc. Rogue Legacy(TM) is a trademark or registered trademark of Cellar Door Games Inc. All Rights Reserved.